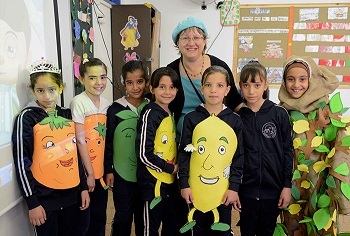 Dr. Donna Zfat-Zwas, Director of the Hadassah Medical Center’s Linda Joy Pollin Cardiovascular Wellness Center for Women, joined her team on a visit to two Palestinian East Jerusalem schools recently to see how well the Center’s heart health message is playing out among the children and their mothers. Inside the Al-Eisawieh School for Girls, a public school in the Arab neighborhood adjacent to Hadassah Hospital’s Mount Scopus campus, the stairs and walls of the school are decorated with tomatoes and cucumbers. A play is going on in the gym, where a girl dressed as a milk carton is debating another dressed as a Pepsi bottle. In one classroom, the girls are cutting up salad. In another, they’re turning vegetables into flowers to upgrade snack time. It wasn’t always like that. Before, a truck might drove up during recess with soda and junk food for sale. Across town in the Abu Tor girls’ school, the teacher asks how many girls ate breakfast that morning. All the hands fly up. That’s new. Many of the girls didn’t consider eating a healthy breakfast before this. Their moms are delighted, and now often join them at the table. Al-Eisawieh and Abu Tor are two of the Arab neighborhoods of Jerusalem targeted for intervention by Hadassah’s Wellness Center. In these lower-income families, mothers have little exposure to health education and little time and money to take care of themselves. 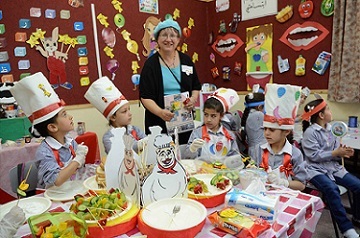 In addition, since the schools have launched these creative educational programs, the teachers have lost weight too!